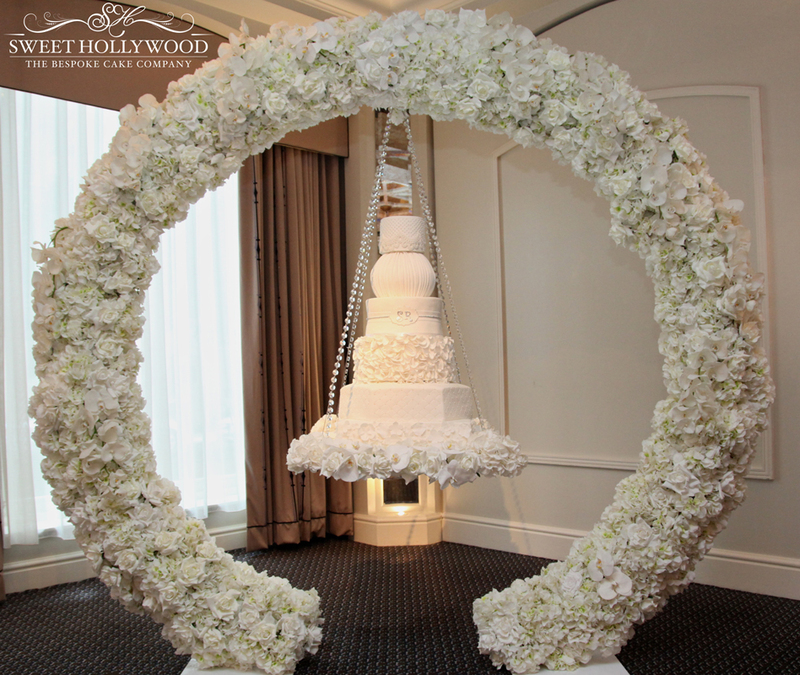 Sweet Hollywood luxury wedding cake designers push boundaries and our unique creative flare to new heights with our Halo Hanging Wedding Cake which was showcased at our clients intimate wedding @ The Berkeley, Hotel in the heart of Knightsbridge London. Our client Rosie Reed was looking for a unique wedding cake that would be the centrepiece of her intimate wedding and after coming across some of our luxury wedding cakes online she was confident that Sweet Hollywood would be able to deliver her dream wedding cake. Like all Sweet Hollywood wedding Cakes, the colours and design can be customised to match your theme or outfit. Furthermore this and other cakes can be made Egg Free Wedding Cake / Eggless Wedding Cake to suit your dietary requirements.